Radiography is an art and science which involves the medical imaging of patients to produce a radiograph for the diagnosis of disease. The main goal of the radiographer is to produce the highest quality diagnostic image using ALARA (As-Low-As-Reasonably-Achievable) Radiation Standards with a minimum amount of patient discomfort. A radiographer’s job duties involve multiple areas of expertise—trauma, surgery, fluoroscopy, portable/mobile, and general diagnostic radiography. Constant growth in the field has created many new and existing careers in ultrasound, Computerized Tomography (CT), Magnetic Resonance Imaging (MRI), Mammography, and cardiovascular/interventional radiography. We have two degree programs: Associate of Science in Radiography (ASR) and the Bachelor of Science in Medical Imaging Technology (BSMIT). The BSMIT Program is entirely online, except for a clinical practicum or internship. Students may also receive special credit if they hold a post-primary certification. Our Associate of Science in Radiography is the first step. Our Bachelor of Science in Medical Imaging Technology (BSMIT) program builds on the knowledge of registered radiographers in good standing with the American Registry of Radiologic Technologists. To join either program, you must first be accepted as a student at Indiana University South Bend. All students entering the Dwyer College of Health Sciences begin as Health Sciences majors. Why Choose a Degree in Radiography or Medical Imaging Technology? 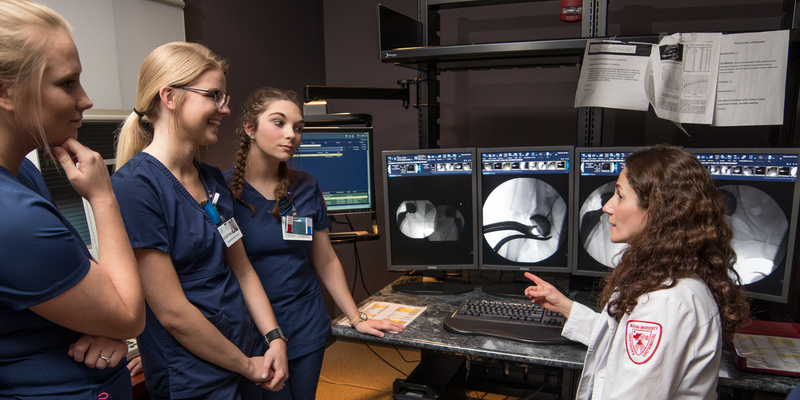 The Radiography Program at Indiana University South Bend is committed to serving north-central Indiana and south-west Michigan through the operation of excellence in teaching and learning. The mission of the Radiography Program is to create professional and knowledgeable technologists through a comprehensive education in Radiography. The goals of the Radiography Program are to promote the effectiveness of radiographic skills needed for employment, sound patient care, effective communication, and strong ethical judgement. Through continuous improvement, we will serve our community by educating students with a strong work ethic and values. The student will graduate clinically competent. The student will be able to effectively communicate. The student will display critical thinking skills. The student will exhibit professional behaviors. The student will demonstrate service learning in the community. The student will complete a variety of diagnostic exams. The student will apply the principles of radiation safety. The student will demonstrate good communication with diverse populations in the clinical setting. The student will demonstrate good verbal and written communication skills. The student will be able to accurately evaluate radiographic images for diagnostic quality. The student will be able to perform trauma radiography. The student will demonstrate effective patient care. The student will be dependable in clinic. The student will explain the importance of civic engagement within the community. The Division of Medical Imaging is based on the belief that the student radiographer should experience as many forms of educational opportunity as possible in both the didactic and clinical setting as part of their student learning environment. In today's dynamic healthcare field, the student needs to be given the necessary skills to adapt to constant change. It is our belief that general education coursework in English composition, mathematics, human anatomy and physiology, public speaking, and medical terminology will enhance the abilities of the graduate technologist while the attainment of the associate degree will elevate their professional status. The division functions in partnership with the university and the medical facilities within the regionally served community. This partnership involves on site clinical education sites for our students and gives the Division of Medical Imaging the responsibility to provide the community with clinically competent graduate radiographers who will model proper professional behaviors. The students, the community, and the University benefit in an environment of trust and cooperation between all involved parties. At IU South Bend, you can earn an Associate of Science in Radiography and a Bachelor of Science Degree in Medical Imaging Technology. The AS curriculum educates the radiographer to become adept in the performance of any diagnostic radiographic procedure. Courses in radiographic principles, radiographic procedures, clinical application of theory, digital imaging, radiation protection, and general education are included in the curriculum. Students also receive instruction in the theory and practice of diagnostic imaging modalities in addition to diagnostic radiography. The 2017-2018 Radiography Handbook provides details and specific policies and procedures about the program. Radiographers use radiation equipment to produce images of the tissues, organs, bones, and vessels of the body, as prescribed by physicians, to assist in the diagnosis of disease or injury. Graduates are eligible to take the certification examination of the American Registry of Radiologic Technologist (ARRT) to become certified as a Registered Technologist (RT). The BS curriculum educates the registered radiographer to become practiced in a specific imaging modality or complete nonclinical work over a variety of medical imaging modalities. Students must graduate from an accredited AS program before joining the BSMIT program. Courses for the BSMIT degree include, Medical Imaging Technology Principles and Procedures, Sectional Imaging Anatomy and Pathology, Medical Ethics, and Research in Medical Imaging Technology. A clinical practicum or internship is required in a specific modality. A student may also substitute the clinical practicum or internship with especial credit if the student has a post-primary imaging license. Imaging Technologists function in many different roles within the health professions. They may work independently or interact with other members of the health care team such as radiologists, surgeons, emergency medicine physicians, cardiologists, and nurses. Imaging Technologists are employed in hospitals and outpatient facilities such as occupational and urgent care centers, clinics, and doctor's offices. The constant growth in the field has created many new and exciting careers in ultrasound, computerized tomography (CT), magnetic resonance imaging (MRI), mammography (M), cardiovascular/interventional radiography, radiation therapy, and nuclear medicine. All graduates of an accredited radiography program must take and pass (with a score of 75%) the national credentialing examination administered by the ARRT to become certified as a Registered Radiographer, R.T. (R). Graduates of the Bachelor of Science in Medical Imaging Technology Program, which builds upon the AS in Radiography Program, must also take and pass a national credentialing exam in one of the following disciplines offered at IU South Bend if pursuing a clinical program. IU South Bend AS in Radiography program graduates have a 98% first-pass rate on the ARRT over a 10-year period on the national credentialing exam which exceeds national averages as reported by the ARRT. Our department consists of 2 full-time faculty members (both of which are IU South Bend graduates), 8 adjunct faculty members, and a full-time administrative assistant and multiple clinical instructors who work directly with students at affiliated clinical agencies in the community. All of our faculty members have previous and/or current experience working as medical imaging professionals. Continuing education in a technologically based program such as Radiography and Medical Imaging is crucial, and faculty consistently exceeds the CE credits required to maintain our certifications.